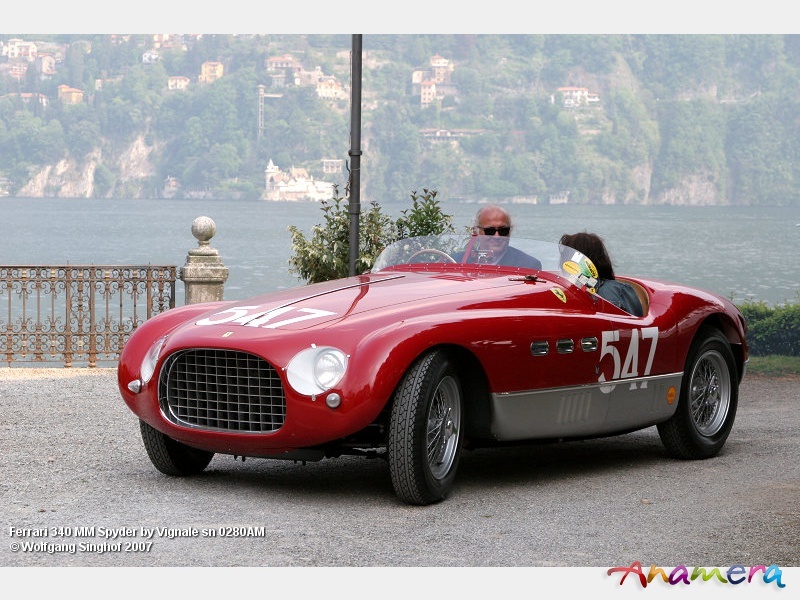 The 340 MM was built for the 1953 Mille Miglia. 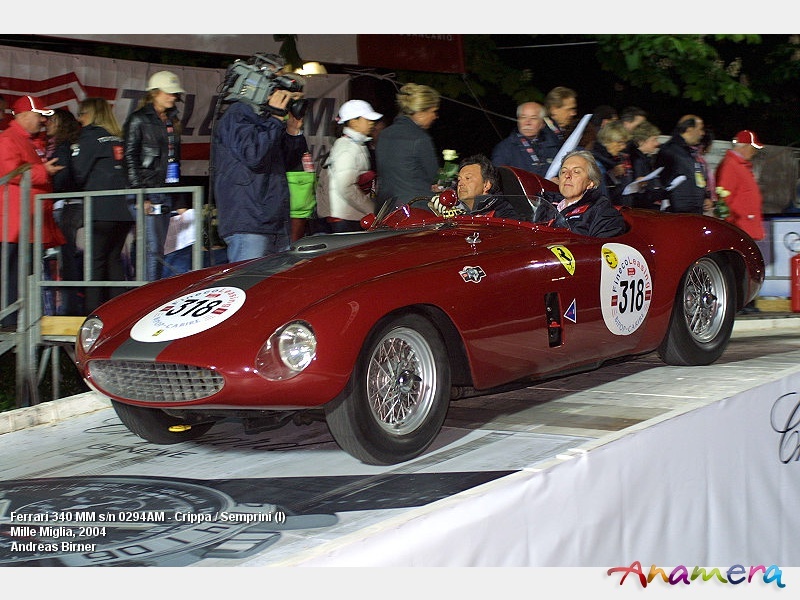 Giannino Marzotto won the Mille Miglia in 1953 with a barchetta version with coachwork by Vignale 0280AM and Marzotto set a new record speed in the race with an average of 142 km/h. In the hands for experienced drivers the powerful cars could show their entire potential. Gigi Villoresi was one of the greats who did, roaring to victory in the Giro di Sicilia in the same year. 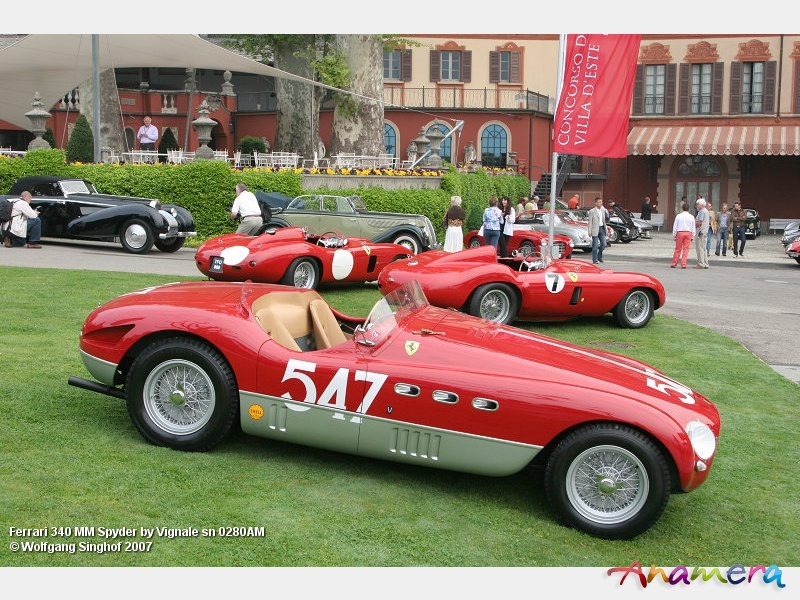 In 1953 10 340 MM were built 4 with Berlinetta coachwork by Pinin Farina (0236MM, 0318AM, 0320AM, 0322AM), 6 with Spyder coachwork, 2 by Touring (0268AM, 0294AM) and 4 by Vignale (0280AM, 0284AM, 0324AM, 0350AM). 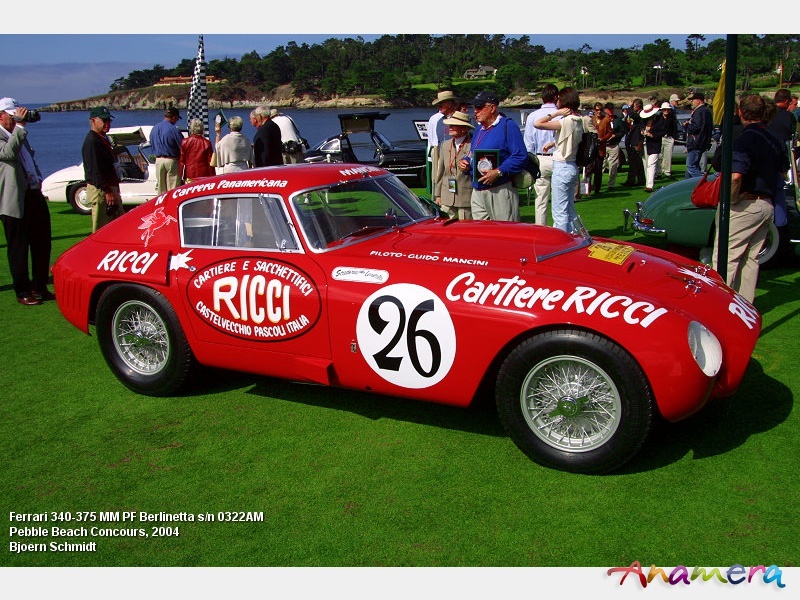 0236MM was a "250 MM Pinin Farina Berlinetta" initial was raced by Pierre Boncompagni - "Pagnibon" with a 340 MM engine according to PF records, anyhow Andre Vanoni in Algeria received 0236MM with a 250 engine. 0268AM was a 340 MM Touring Spyder, it is the sole surviving, but we miss the excisting shape know from many other Touring bodies. 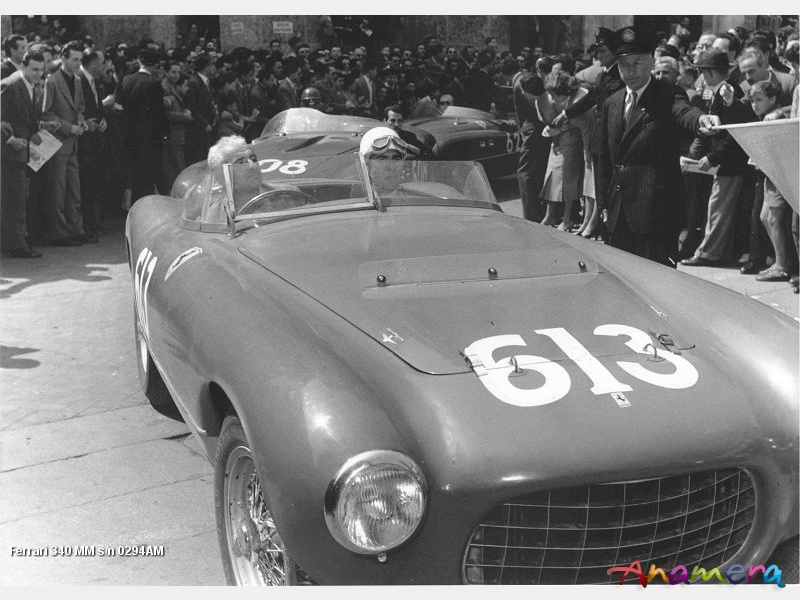 In 1953 it already retired at Ravenna with a broken differential, driven by Giuseppe Farina and Luigi Parenti. After Pierre Pagnibon had a fatal crash in the 12h Hyeres race, it was returned to the factory were it was discovered by Luigi Chinetti, he bought the car, had it rebuild and imported it to the US, in 1959 it was raced in Santa Barbara by Jack Brumby. 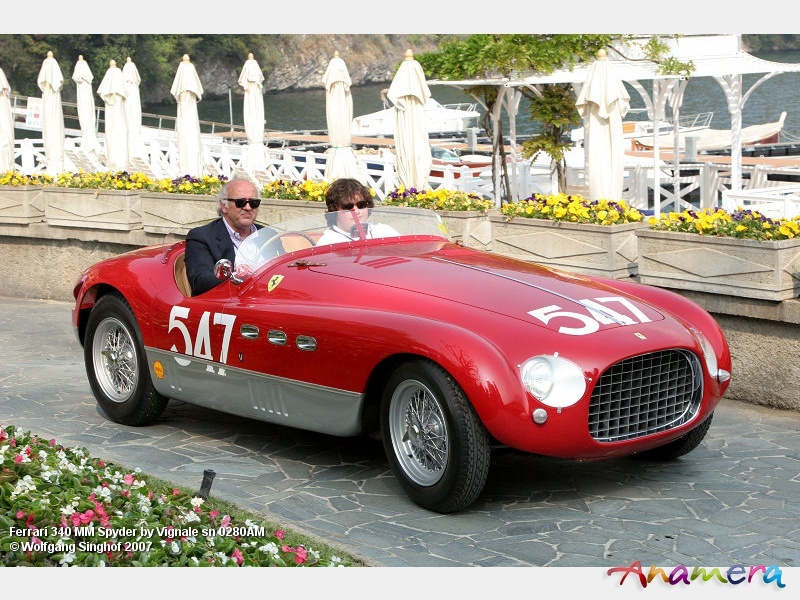 In May 2007 it was sold in the The Ferrari Leggenda e Passione RM Auction for 2,310,000 €. 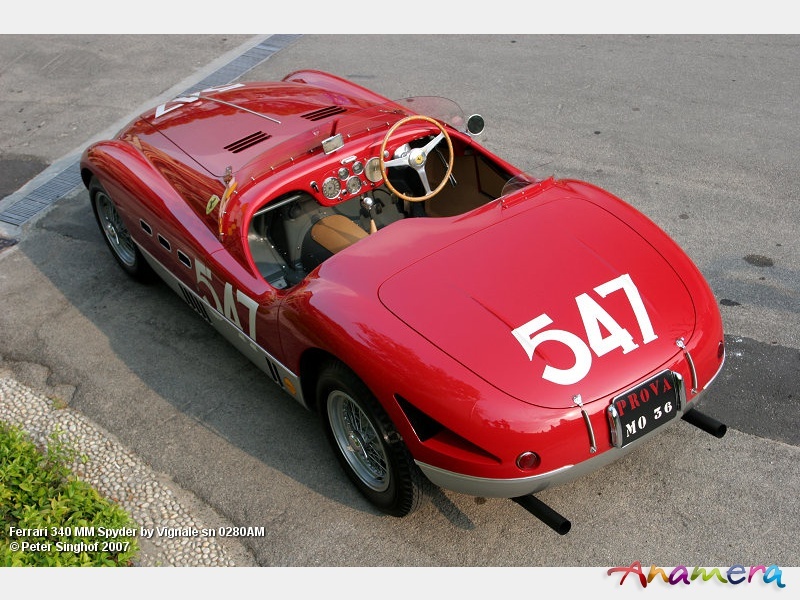 0280AM is a 340 MM Vignale Spyder and was a Scuderia Ferrari car, driven to victory in the 1953 Giro di Sicilia by Luigi Villoresi and Cassani and with Giannino Marzotto and Marco Crosara it won the Mille Miglia in the same year. Later raced by Elio Checcacci in the Tour de France. 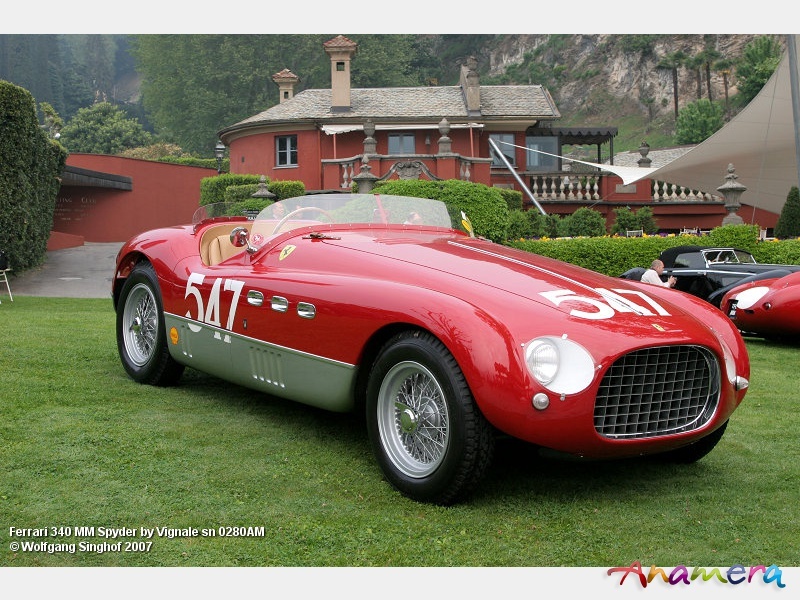 0284AM was a 340 MM Vignale Spyder delivered to Thomas Cole of Los Angeles, he finished 4th OA in the 1953 Mille Miglia with Co-Pilot Mario Vandelli, he also finished the International Trophy in Silverstone in 2nd position, Tom Cole also had entered the 24h Le Mans race with Luigi Chinetti in which he got killed. Following Tom Cole's crash at Le Mans the wreck was stored in the warehouse of Modenese dealer Mario Camellini until 1969, it was then rebodied by Fantuzzi as Touring Barchetta. 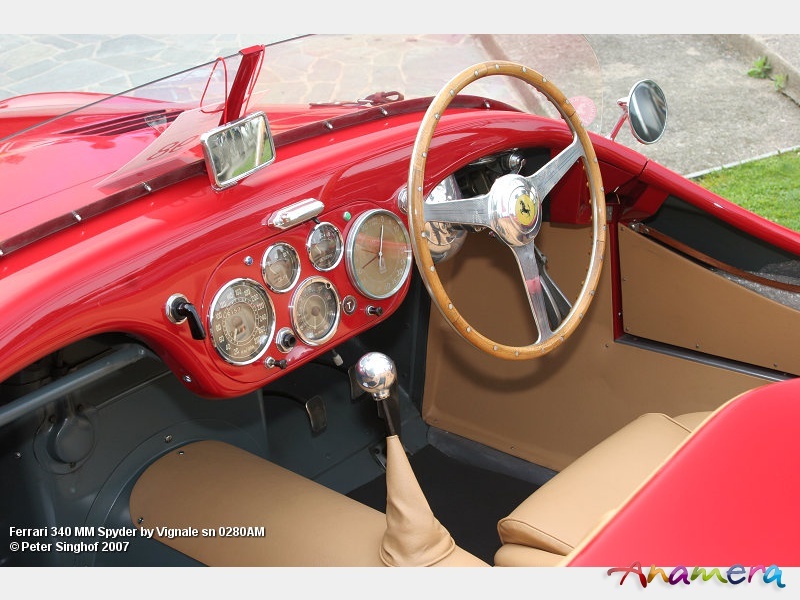 0286AM started life as a 340 MM with Spyder coachwork by Vignale, it was a Scuderia Ferrari factory race car. The engine capacity was enlarged to 375 Plus specs. It was enteered in the GP Senigallia, driben by Luigi Villoresi but dnf. 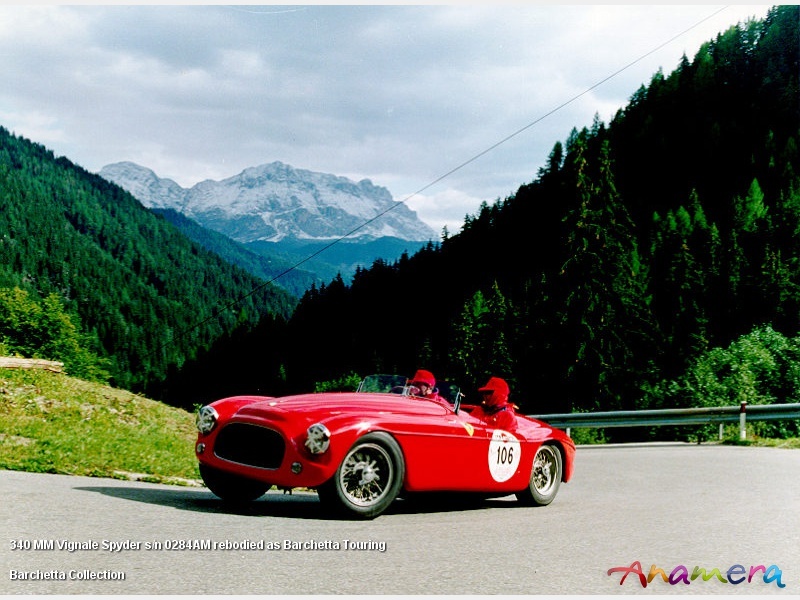 In the same month 21 days later it won the 1000km Nuerburgring race with Alberto ascari and Giuseppe Farina. 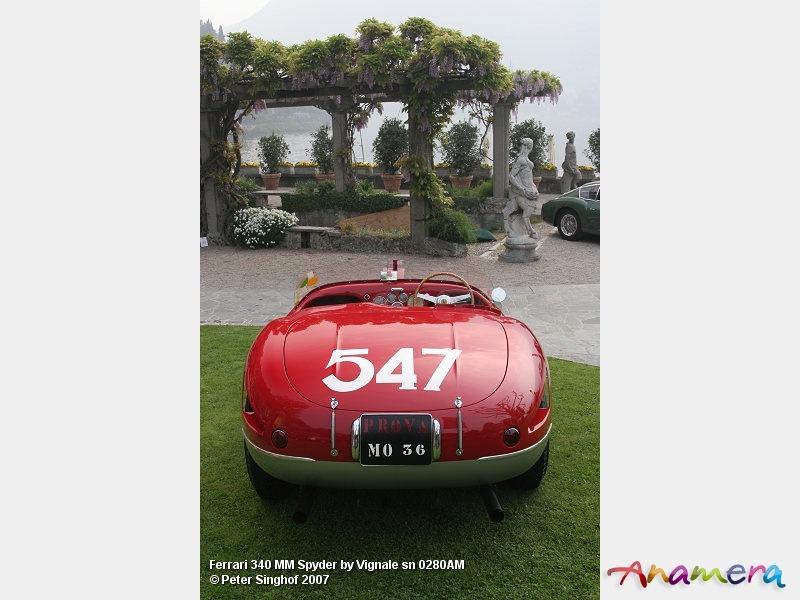 It was sold to Luigi Chinetti and entered in the 1953 Carrera Panamericana, driven together with Alfonso de Portago to a no finish. 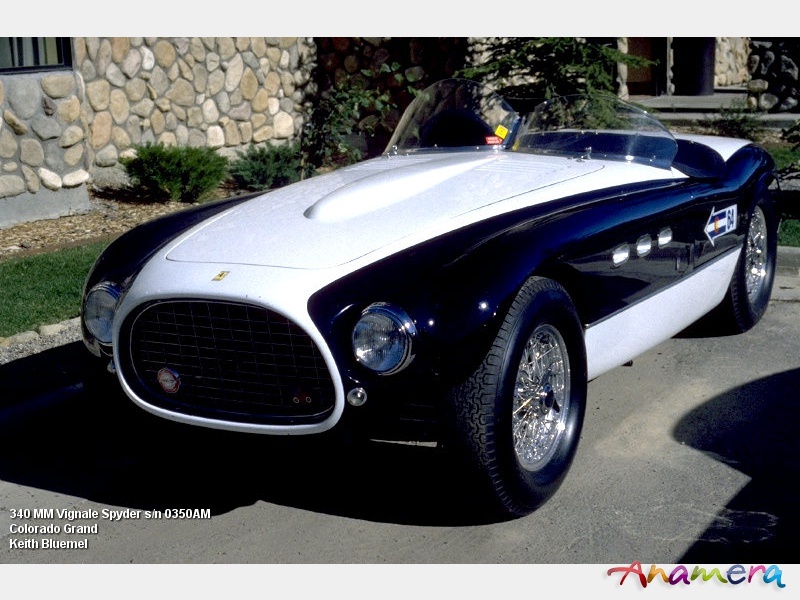 Thereafter sold to Mexican Carlos Braniff and raced to 2nd OA at Bergstrom AFB, in 1954 Allen Guiberson bought the Vignale Spyder added headrest with tailfin. The coming F1 World Champion Hill Phil finshed 2nd OA at March AFB and 14 days later also 2nd OA in the grueling Carrera Panamericana race together with Richie Ginther, in 1955 Carroll Shelby added several podium finishes to the Vignale Spyders CV. Louis Brero sr. was the next owenr whop raced the 375 until 1957. The car was placed in an earth whole. Finally nearly 40 years later Symbolic Motor Cars could negotiate with the Brero family to buy the car and bring it back to life ... another one saved. Today it belings to the collection of Bruce McCaw. 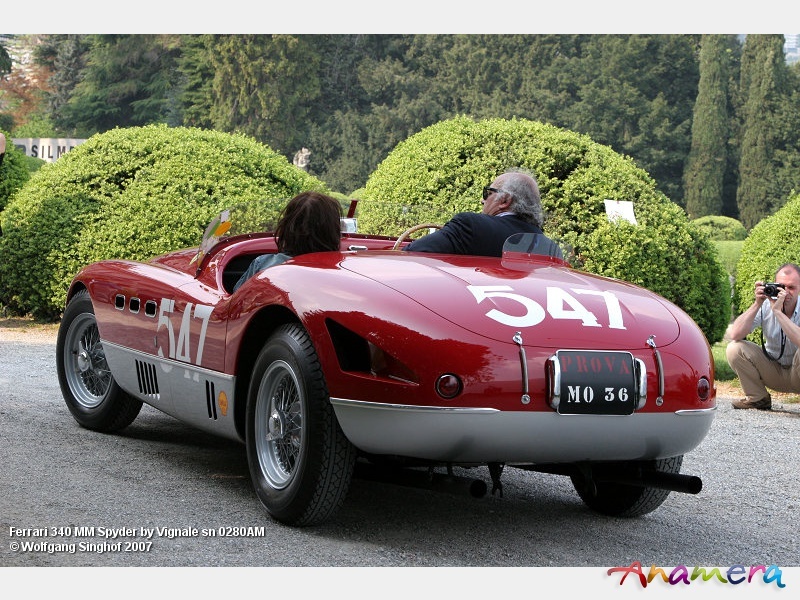 0294AM was 340 MM Spyder with coachwork by Touring, Luigi Villoresi and Pasquale Cassani did not finish the 1953 Mille Miglia due to an accident and won the International Trophy in Silverstone. The car was then sold to Hans Ruesch who ran the car in many international races, with some success but also with some accidents. 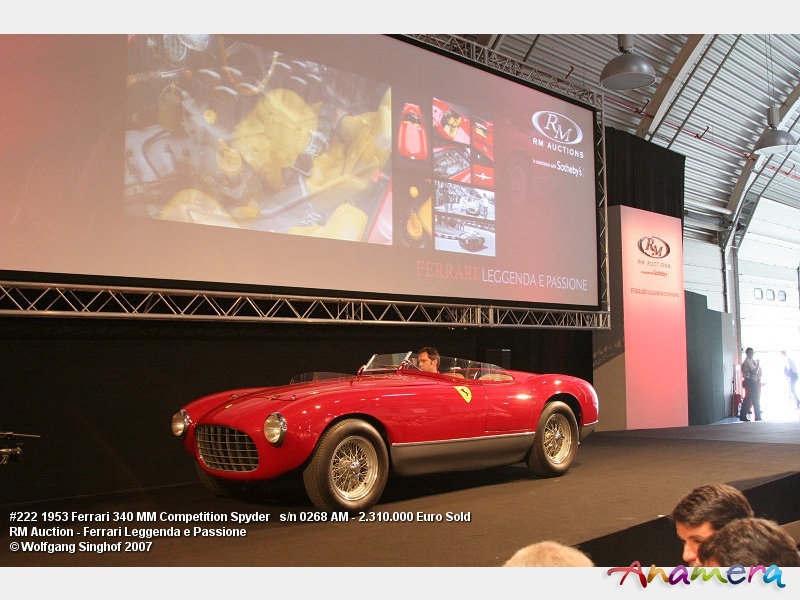 After the accident in the Supercortemaggiore from Merano, it was returned to the factory. Ferrari substituted the damaged front oval tube with a stronger rectangular tube 100x50mm, length 460mm. 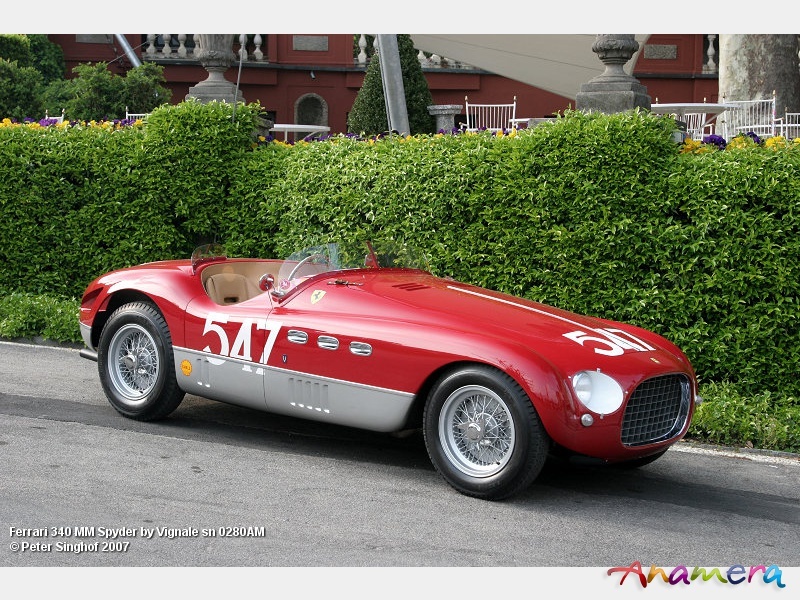 Then 0294AM went to Scaglietti to be rebodied as Monza. The chassis has been repaired at Ferrari factory, it is well reported on the car's foglio di montaggio "commessa n.672- Fattura 397/54" 'riparazione del telaio'. It was bought by Chinetti Motors of New York. 0318AM was a 340 MM Berlinetta with Pinin Farina coachwork, before Le Mans the engine capacity was increased to 375 MM specs, it dropped out after 10 hours with Ascari and Villoresi sharing the drive. 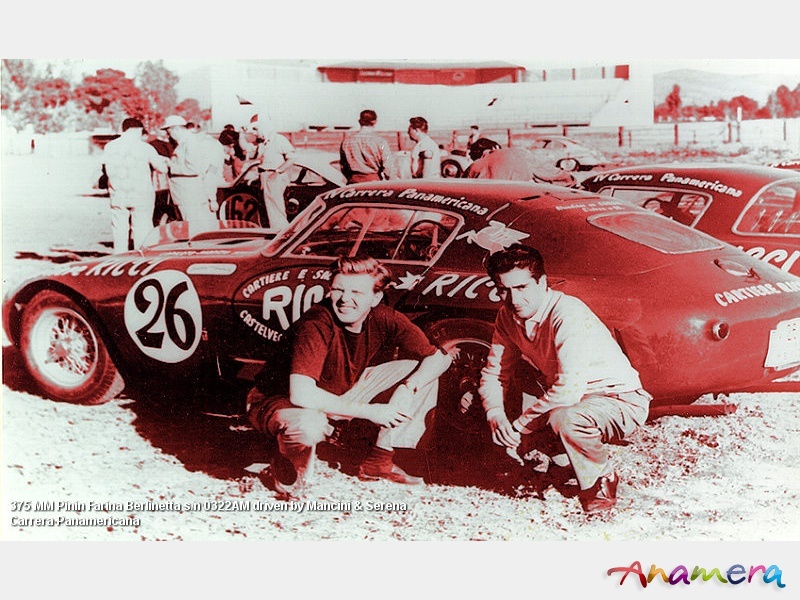 After a tire blew up in the Carrera Panamericana race Stagnoli and Scotuzzi were killed. 0320AM was a 340 MM Berlinetta with Pinin Farina coachwork and a factory entry in Le Mans, Mike Hawthorn and Giuseppe Farina were disqualified in the 12th lap when in 2nd position. 0320AM did not finish the Senigallia and 24h Spa race, but was victorious in the 12h Pescara race. It finished 6th over all in the Carrera Panamericana. The engine was upgraded to 375 MM specs. 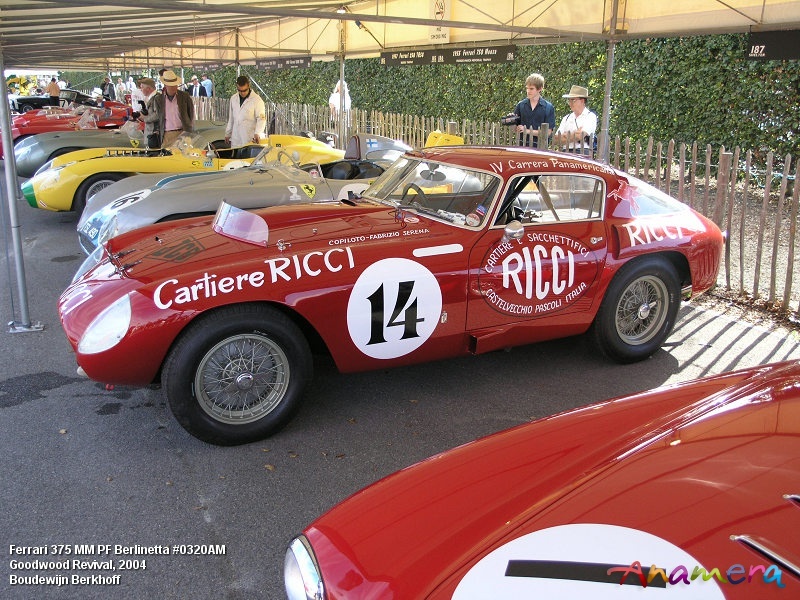 0322AM was a 340 MM Berlinetta with Pinin Farina Coachwork and a factory entry in Le Mans were it finished 5th over all driven by Paolo and Giannino Marzotto, in the 12h Reims race it was disqualified. 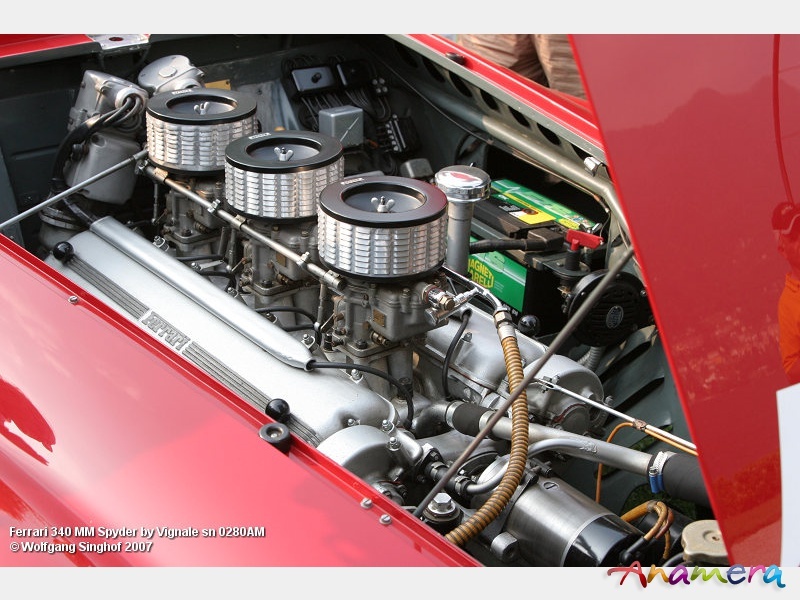 It went back to the factory and the engine was brought up to 375 MM specs. 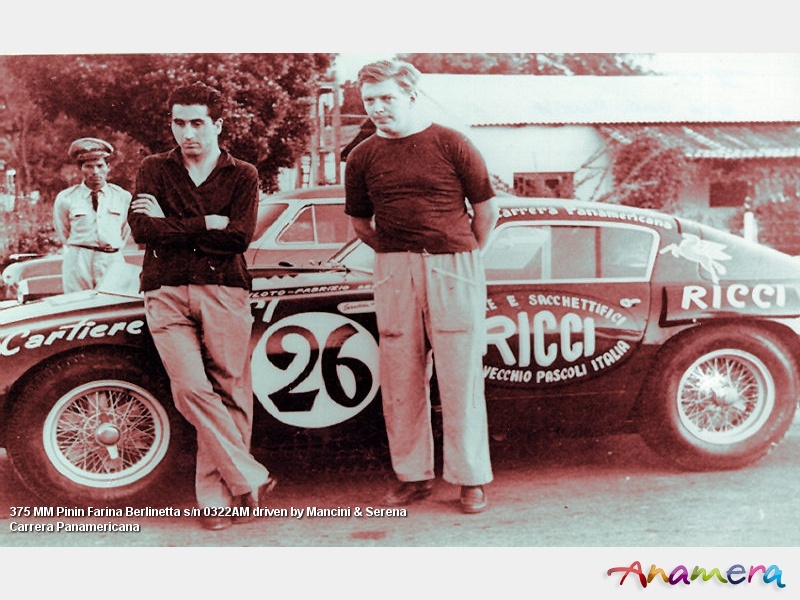 It won the 24h Spa and the Senigallia race, dropped out in the 12h Pescara and was a "did not start" in the 1000km Nuerburgring race , Mike Hawthorn, Giuseppe Farina, Paolo Marzotto, Luigi Villoresi, Alberto Ascari, Guido Mancini and Fabrizio Serena di Laprigio had the luck to drive this car. It finished 4th in the Carrera Panamericana. 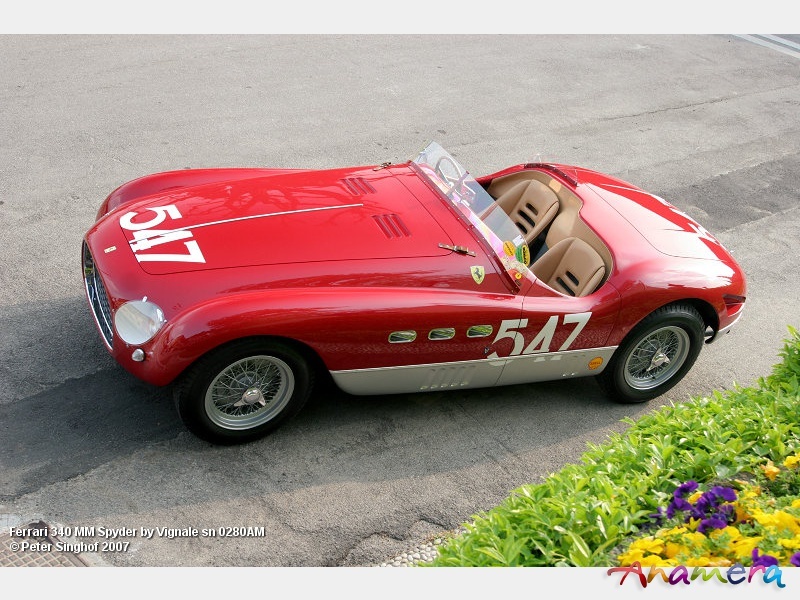 In May 2007 it sold in the Ferrari Leggenda e Passione RM Auction in Maranello for 4,235,000 €. 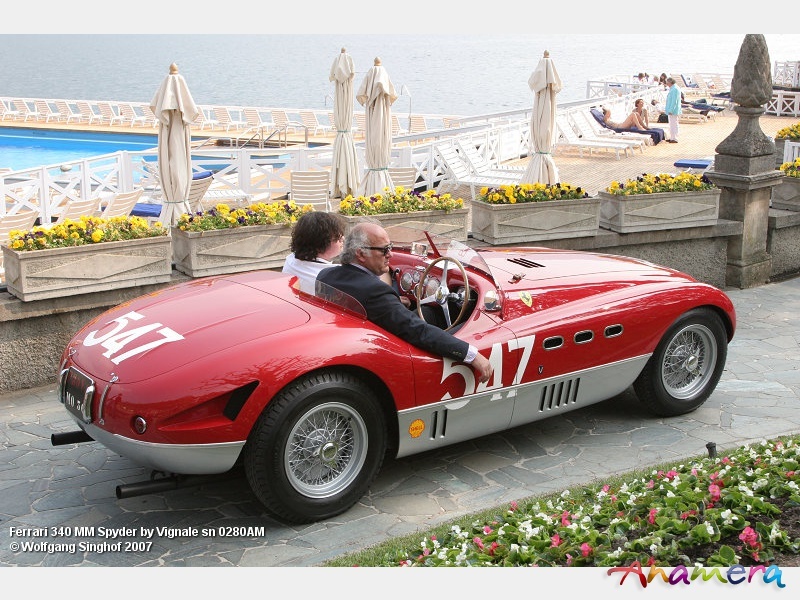 0324AM was a 340 MM Spyder with Vignale coachwork delivered to William Spear of Westport, CT. 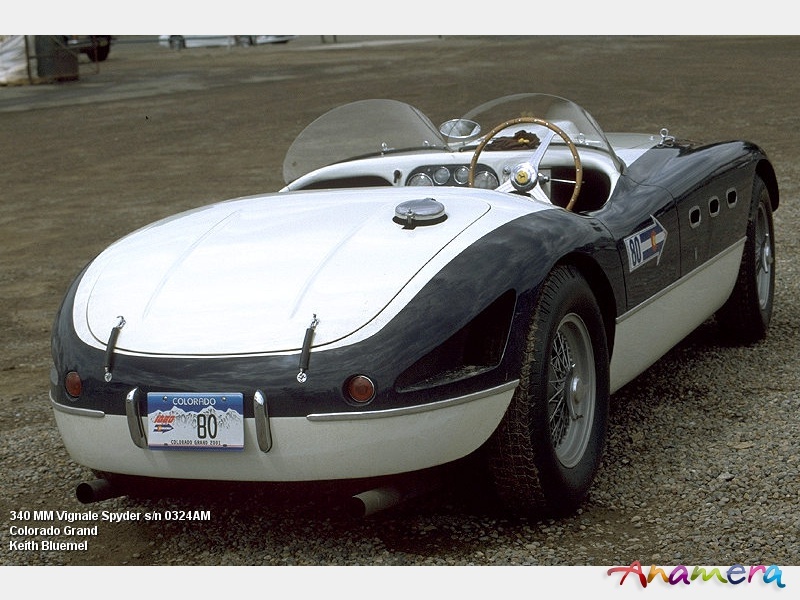 This Spyder was raced with success until 1956 in the US. 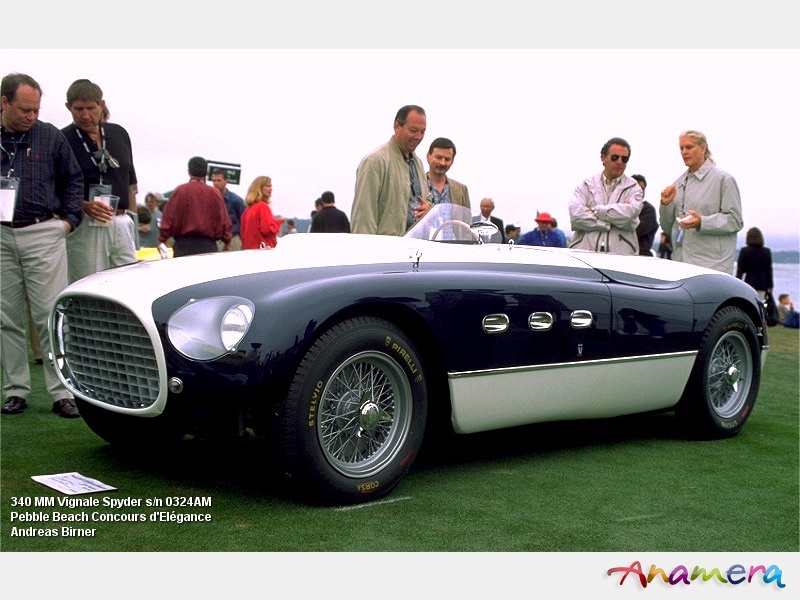 0350AM was a 340 MM Spyder with Vignale coachwork delivered to Sterling Edwards of San Francisco, CA, it '53 and '54 it won several races in the US.